It has been a week! I know I’m late with this post, and for that I apologize. My brother-in-law made an impromptu appearance, so we wanted to maximize our time with him. This craft wasn’t what I was originally planning to make, but Michael’s didn’t have the items I needed in stock, so I switched it up. 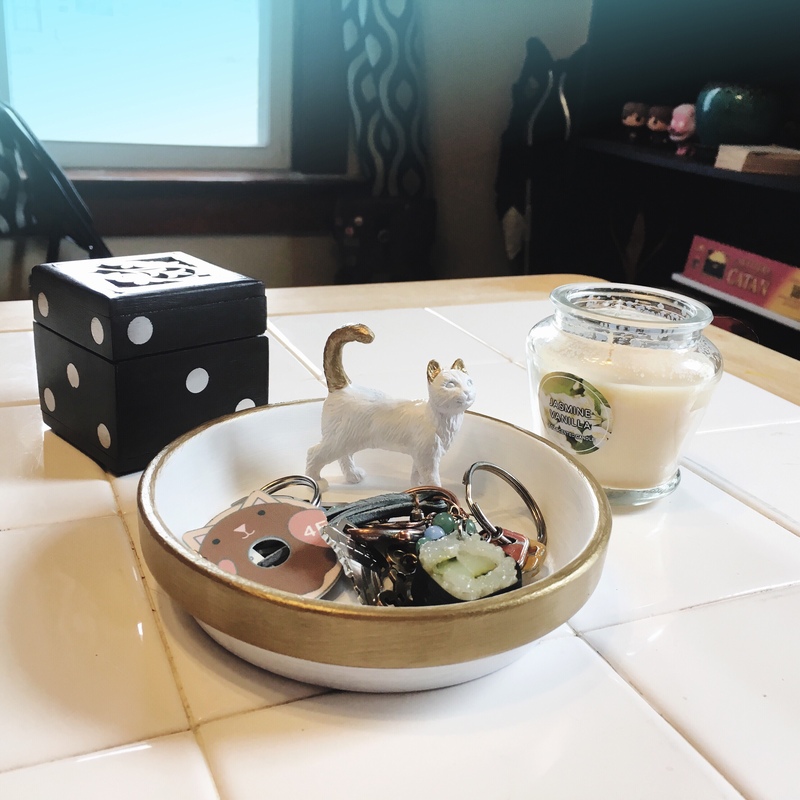 I found the directions for this kitty cat trinket dish on Michaels.com and it was too cute for a cat-lover like me to pass up! 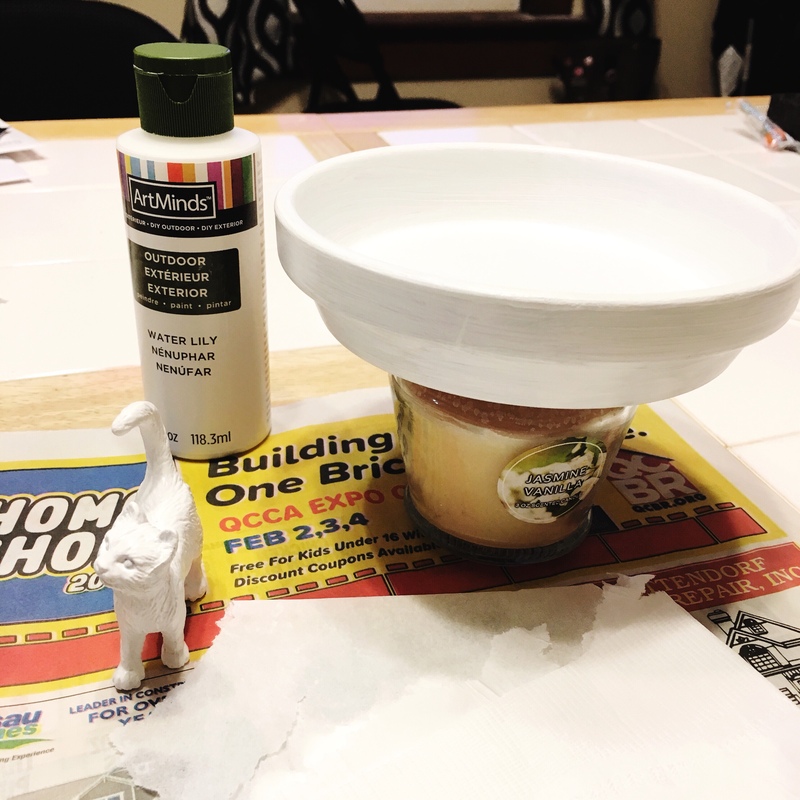 It’s super easy to make, although it takes a while with the layers of paint. 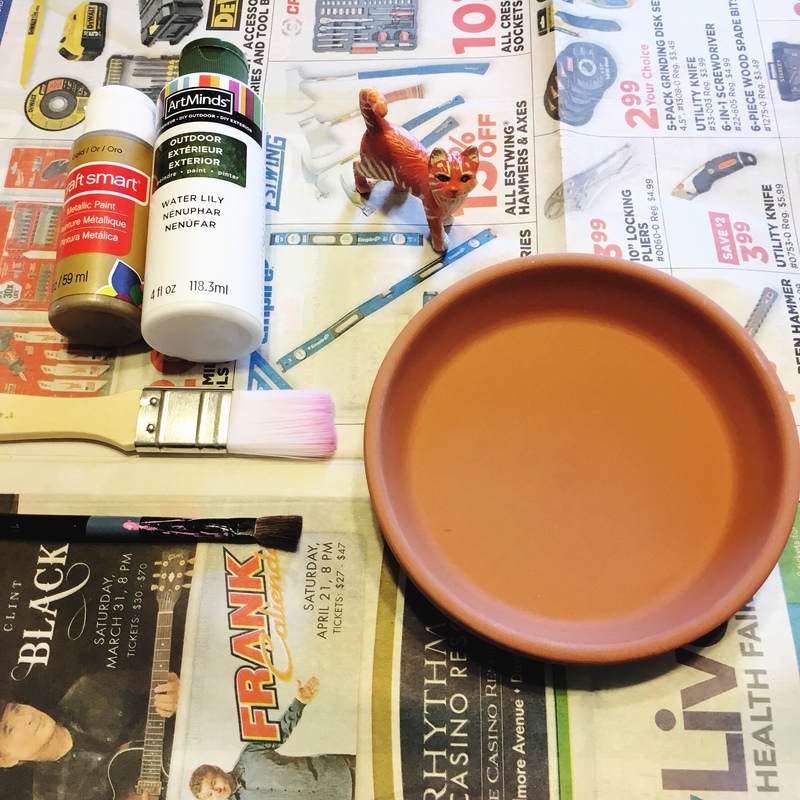 All you need is a terracotta saucer, a cat figurine, some paint and some glue. I’m sure you could customize this craft with any animal and whatever colors you wanted. The original directions call for actual gilding liquid, but I’m cheap and decided to use gold paint I already had on hand. Paint the saucer and the cat. I painted both entirely white first, thinking my gold paint would pop more from a white base. It took 3 coats for me to be satisfied with the cat figurine and 4 coats for me to be happy with the coverage on the terracotta saucer. I did this over two days, letting each layer of paint dry completely in between applications. Luckily I had my brother-in-law in town to entertain me! 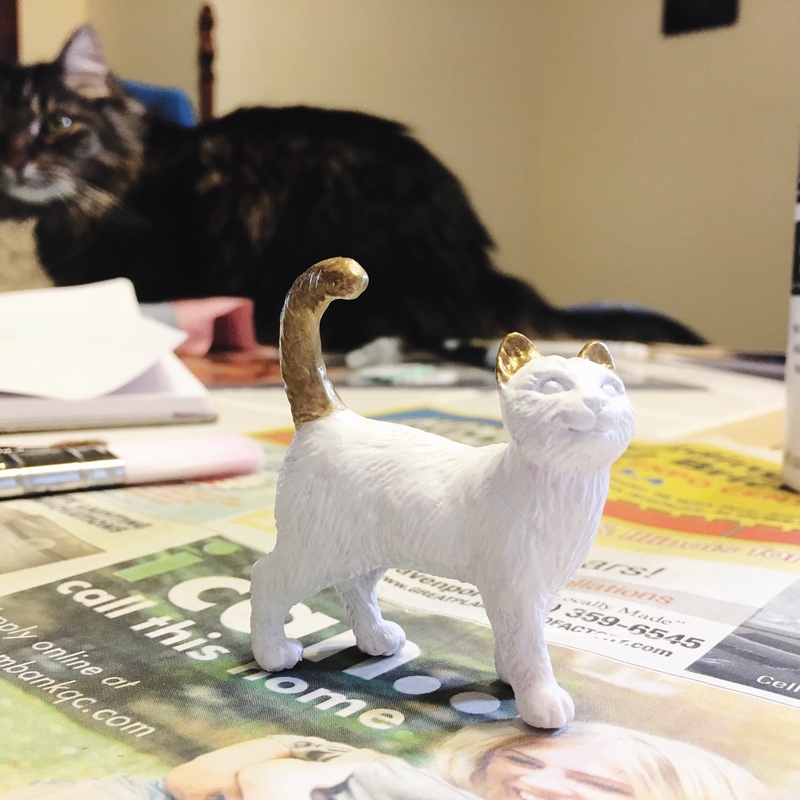 I applied the gold paint to the cat figurine first. I started on the tail. It didn’t start off covering well, and I started to get worried. I moved on to the ears, which took the paint much better for whatever reason. I let the gold dry and went over it again and it looked better. For the gold paint, it took 3 layers on the tail and only 2 on the ears. On the saucer, I went 5 layers until I was happy with the way it looked. Then it’s time to glue! The original directions have you glue the cat figurine in the middle of the saucer, as a ring holder. But I only wear my engagement ring, and I don’t take it off, so a ring holder is pointless for me. I ended up gluing the figurine near the edge of the saucer. It becomes a multi-functional trinket dish then, instead of a ring holder. I was really pleased with how the whole project turned out. It may have taken a while due to the layers of paint, but it was easy to put together. I am tempted to make more with other animal figurines as gifts. Would you use it to hold loose change, your keys, jewelry, or something else? Let me know in the comments!